US Employers Added 148,000 Jobs in Dec., Unemployment Rate Stays 4.1 Pct. 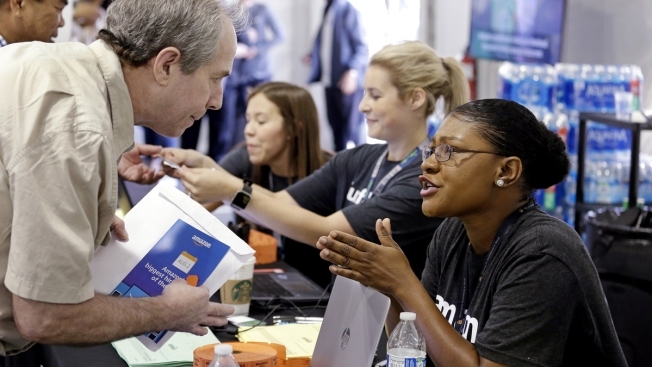 In this Aug. 2, 2017, file photo, Jamie Rubinstein, left, first in a line of applicants, talks with Amazon worker Vanessa Chandler as he begins the recruitment process at a job fair at an Amazon fulfillment center, in Kent, Wash.
U.S. employers added 148,000 jobs in December, a modest gain but still enough to suggest that the economy entered the new year with solid momentum. The unemployment rate remained 4.1 percent for a third straight month, the lowest level since 2000, the Labor Department said Friday. For all of 2017, employers added nearly 2.1 million jobs, enough to lower the unemployment rate from 4.7 percent a year ago. Still, the data indicates that job gains are slowing, which typically happens when unemployment falls to ultra-low levels and fewer people are available to be hired. Average job gains have declined to 171,000 this year from a peak of 250,000 in 2014. Last year's job gains were the fewest since 2010. Despite the low unemployment and the difficulty some employers face in finding enough qualified workers, pay gains remain sluggish. Average hourly earnings rose 2.5 percent in December from a year earlier — about a full percentage point lower than is typical in a healthy economy. Still, the December job growth, while modest, underscores the economy's continued health in its ninth year of recovery. Last month's pace of hiring is enough, over time, to lower the unemployment rate. The unemployment rate for African-Americans reached a record low of 6.8 percent in December. And the jobless rate for veterans of Afghanistan and Iraq fell to 3.3 percent, also a record low. Solid economic growth in both the United States and major countries overseas is supporting more hiring. Factory managers received the most new orders in December than in any month since 2004. Retailers have reported strong holiday sales. Builders are ramping up home construction to meet growing demand. Sales of existing homes reached their fastest pace in nearly 11 years in November. Consumer confidence is at nearly a 17-year high. And the Dow Jones industrial average reached 25,000 for the first time on Thursday. Manufacturing and construction reported strong job gains in December, adding 25,000 and 30,000 jobs, respectively. A category that includes hotels and restaurants gained 29,200. Retailers cut 20,300 jobs, mostly in department store chains such as Macy's, which announced this week that it would close 11 additional stores. That suggests that stores hired fewer seasonal workers for the winter holidays, a sign of the impact of e-commerce. Transportation and warehousing, a category that has grown substantially this year to keep up with online deliveries, added just 1,800 positions in December. Most economists expect the Trump administration's tax cuts to help speed the economy's already decent pace of growth. Some envision the unemployment rate dropping as low as 3.5 percent by the end of 2018. A rate that low would mark the lowest such level in nearly a half-century, and it would likely force businesses to accelerate pay raises to attract and retain employees. Pay raises have remained puzzlingly weak for many U.S. workers despite the robust job market. Some businesses, though, are already howling that they can't find enough qualified people. There are roughly 6 million available jobs, near a record high, according to government data. Should unemployment fall to 3.5 percent, those complaints will intensify. For at least two years, economists have been expecting the falling unemployment rate to boost wages. They point to several trends that may be keeping a lid on wage gains. As the vast baby boom generation ages — 10,000 of them are turning 65 every day — they are retiring and are being replaced by younger workers, who typically earn far less money. That is likely suppressing overall wage growth, economists say. Worker pay also depends on productivity, or how efficient employees are. And productivity has been weak for roughly a decade. In 2000, the last time the unemployment rate fell this low, wages were growing at a 4 percent annual pace. But productivity, which measures workers' output per hour, was much higher then. A falling unemployment rate can force up pay, but rising productivity has a much greater effect. Many businesses, meanwhile, feel they have limited ability to pass on higher wages to consumers in the form of higher prices. Online shopping and cheaper imported goods make it easier for consumers to find bargains. That leaves retailers and other firms reluctant to raise pay.